Noise Blocking - We live in an increasingly noisy world. Blocking out snoring, street noise, inconsiderate neighbors, passing trains and airplanes, and other annoying sounds is critical for getting the sleep we all need so badly. Not only is noise irritating when you are trying to sleep, but it can also throw off your natural sleep cycle -- not to mention all the other health hazards that come with sleep deprivation. NoNoise Sleep is ideal for blocking out that background noise and muffling snoring. 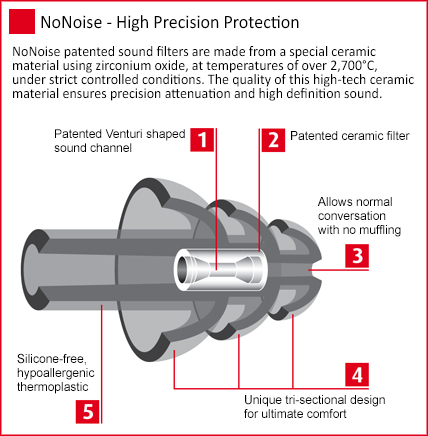 Patented Venturi shaped sound channel keeps disturbing nighttime noises out. Softens snoring and background noise, but keeps alarm sounds clear.